Climate experts say the #1 problem is coal power plants. That’s why we’ve compiled The Macroclimate® 30 – an exclusion list of the 30 largest public-company owners of coal-fired power plants in Developed Markets plus China and India. 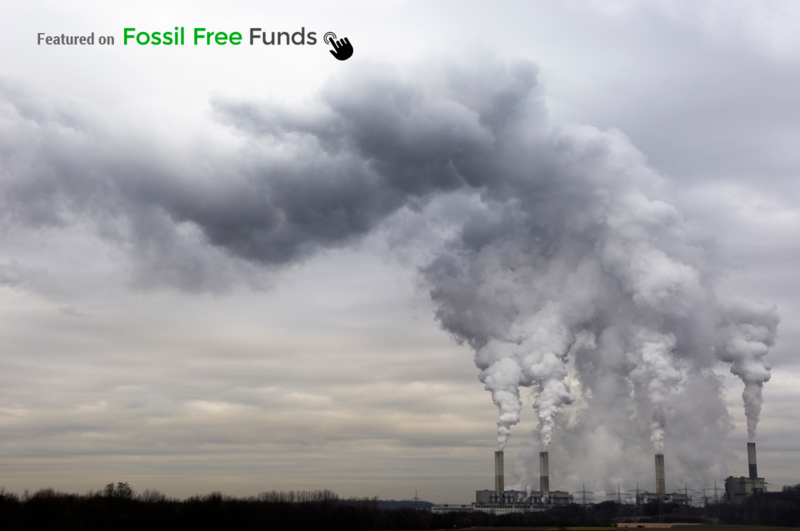 Divesting these 30 companies from your investment portfolio — as well as the owners of coal reserves supplying such plants (The Carbon Underground) — is a prudent and environmentally-responsible investment strategy. Stakeholder engagement (e.g. proxy voting) via As You Sow, Ceres and others also is encouraged. Climate experts predict that burning even just current – that is, known and extractable – fossil fuel reserves would lead to dramatic global warming. For example, in a poll of climate scientists, 92% of expert panelists believe that if all of the world’s current fossil fuel reserves are burned, it is likely or very likely that Earth’s temperature will increase to levels not experienced for millions of years (≥3°C of warming). Unfortunately, the expected consequences of ≥3°C warming are equally dramatic. We can expect with high certainty not only destruction of delicate ecosystems – some of which are critical to the world’s food supply – but also increased frequency and intensity of extreme weather events like floods, cyclones, heat waves, droughts and fires. Other outcomes are less certain but have high consequence. 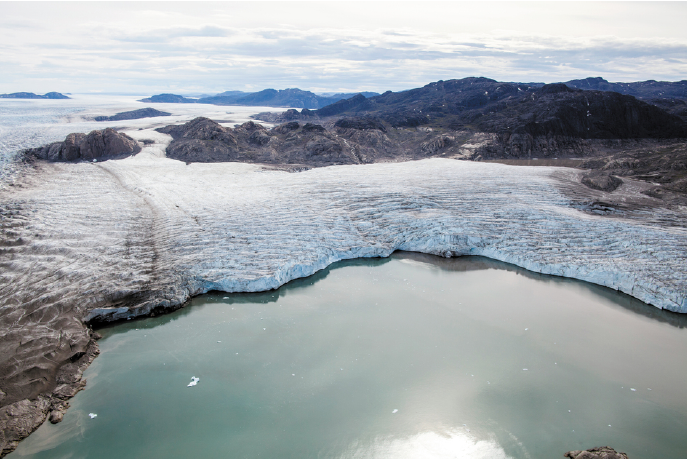 These potential “surprises” include large-scale singular and irreversible events such as rapid melting of the Greenland and/or West Antarctica ice sheets, which would result in significantly higher and faster sea level rise than currently expected. 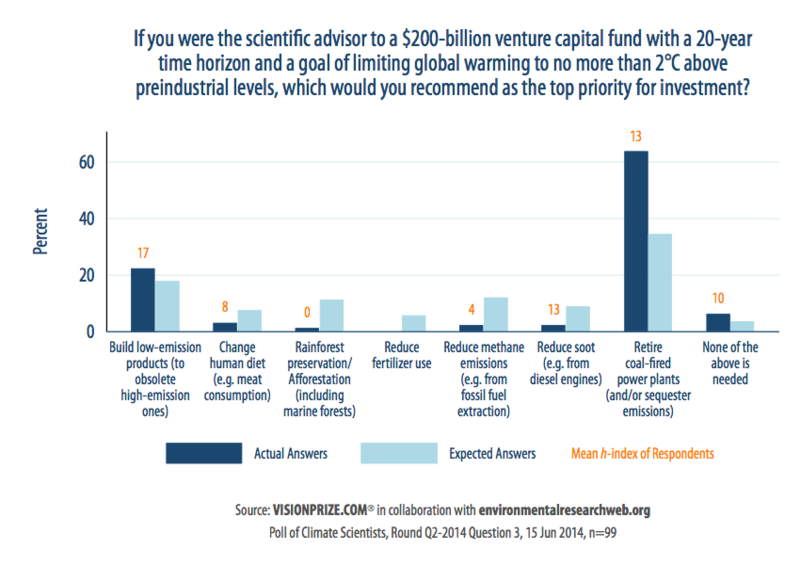 From a climate science perspective, owners of coal-fired power plants – The Macroclimate 30 – would be the first highest priority target for divestment. A majority of expert panelists (64%)1 believe that retiring (or sequestering) coal-fired power plants would be the single most effective use of major investments to limit global warming (Figure 2) and the vast majority (84%) expect that coal-fired power plants alone will contribute between 25% and 60% or more of gross carbon emissions to the atmosphere between now and 2020. This is due in large part to the proliferation of new coal plants in China and in India. China and India already comprise almost 1/3 (9) of The Macroclimate® 30 companies. And this number does not include state-owned utilities in these countries which are among the largest owners and operators of coal-fired power plants worldwide. Expert panelists were pre-screened to ensure they have relevant expertise. Average h-index scores (highlighted in orange) provide an approximate measure of a scientist’s cumulative research impact – a metric for assessing the relative expertise of the participants who selected a given answer. As a point of reference, h ≈ 12 might be a typical value for advancement to tenure at major research universities; membership in the U.S. National Academy of Sciences may typically be associated with h ≈ 45 and higher (Hirsch, PNAS, 2005). The Global Energy Observatory (GEO) – an open source project conceived and developed by scientists and engineers at the Los Alamos National Laboratory – provides a comprehensive frequently-updated database on the name, location, owners, operators, energy capacity (MWe) and status of coal-fired power plants worldwide. We also reference Global Coal Plant Tracker for information on construction of new plants. Macroclimate periodically compiles extracts from the GEO database, associates owners of the largest operating plants (including new construction) in the relevant geographic areas with their respective publicly-traded companies, excludes companies rapidly phasing out their coal fleet, and then ranks the remaining companies by their total coal-fired energy capacity (MWe). Since The Macroclimate 30 is constructed and maintained using open source data, the list is verifiable by others. Vision Prize® Poll of Climate Scientists is a research partnership that captures scientific meta-knowledge on climate risks and solutions, in collaboration with the UK’s Institute of Physics (IOP Publishing’s community website, environmentalresearchweb) and researchers at Carnegie Mellon University. A three-year study of the expert opinions of 340 climate scientists worldwide was completed in December 2014. Members of Macroclimate’s Quantitative Research Team served as project leaders for this study, which inspired — and inform the investment strategy of — Macroclimate’s Digital Wealth Manager Service. While care has been taken to ensure the accuracy of the Macroclimate 30 list, Macroclimate LLC does not guarantee the accuracy or completeness of information contained herein or that it will be current at all times. This information is provided solely for personal, informational, and non-commercial use, and may be redistributed for such use provided it is unmodified and attributed to macroclimate.com. Any other use of these materials without prior written permission is prohibited. Please contact us if you’re interested in licensing this data for commercial purposes. © 2015-2018 Macroclimate LLC. All rights reserved.